Water heaters are responsible for heating water and consistently supplying that hot water to tubs, sinks, showers and appliances. Your water heater can account for 14-18% of your utility bill each month. This water heater buying guide shows you the different types of water heaters and explains how to choose the right size unit for your household's needs. TIP: The Home Depot highly recommends having your new water heater installed by a professional, as it is a difficult and sometimes dangerous process. We offer same-day installation. 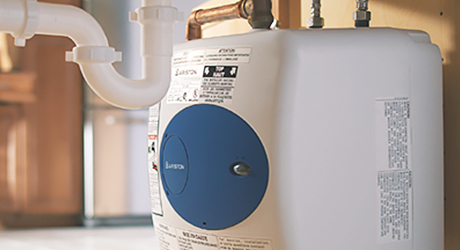 Choose between a traditional storage tank type water heater or a smaller, eco-friendly tankless water heater. They both work with gas and electric fuel sources. TIP: Make sure it fits. Compare the dimensions of your new water heater with the space you have available for your unit at home. Description Stores constantly heated water. Heats cold water with a gas burner or electric element as it passes through the water heater. Heats cold water via an electrical heating element and heat pump that pulls in ambient air and extracts the available heat. Deliver instant hot water to a specific location without wait time. Feature/Benefits Economical. Can be positioned in closet, basement, or garage. Capacity ranges from 20 to 80 gallons. Efficiency varies between models, brands, and fuel sources. Require a larger up-front investment. Hang on wall and frees up floor space. Excellent option for residences occupied part-time. Reduce energy consumption by as much as 30%. Can run out of hot water during heavy usage. Require ventilation. Require a larger up-front investment. Magnesium anode rod extends life of the tank. 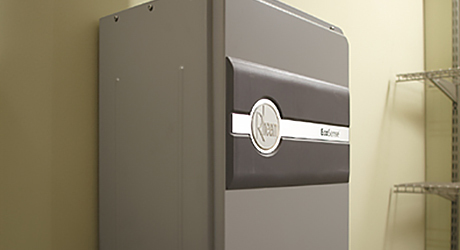 Heat pump delivers more hot water, up to 33 percent faster than standard electric water heater. Typically supplement a whole house system. 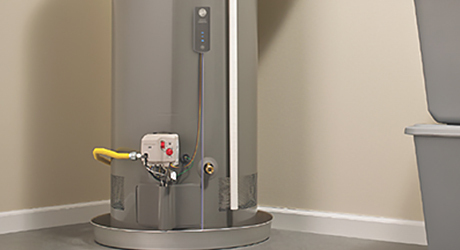 Storage tank water heaters are the most common type of water heater. They heat and store a large volume of hot water that can be dispersed throughout your entire home. Constantly use energy to keep stored water at a temperature near 120 degrees Fahrenheit at all times. If you buy a new tank that's too small, you'll run out of hot water before you need to. And if you get a tank that's too big, you're wasting money on heating water you won't use. Tankless water heaters do not store heated water, but rather heat water only when you turn on the faucet or shower. Can save you money over traditional tank models because they eliminate the expense of continually keeping water hot in a storage tank between uses. May need more than one tankless water heater for you home depending on how far your unit is from all the rooms in your home that need hot water. Point-of-use systems are individual units that install directly under the sink or in a closet to supply a single, specific fixture. Deliver instant hot water to a specific location without wait time. Works with a whole house system when additional hot water is needed. Hybrid water heaters have heat pumps that heat water by pulling the heat out of the surrounding air. Have a higher upfront cost and are larger than standard electric units. More energy efficient, which can result in lower bills. Then choose between a storage tank or a tankless water heater. Choose the right size storage tank water heater by matching its water gallon capacity to the number of people who will regularly be using hot water in your home. TIP: If you need a larger unit than the space you have, you can relocate your unit or ask a Home Depot associate about non- standard sizes, such as a “low boy” model, which is shorter and wider. 1. Calculate your flow rate. Use this chart to calculate the flow rate or gallons per minute (GPM) of hot water each of your fixtures and appliances need. Add these amounts together for the total GPM for your household.For example, if you typically have one shower, a dishwasher and washing machine running at the same time, you have a flow rate of 3.5-7.5 GPM. 2. Find your home’s required temperature rise. Your temperature rise is the difference between your ground water temperature and your desired hot water temperature – typically around 120 degrees Fahrenheit. 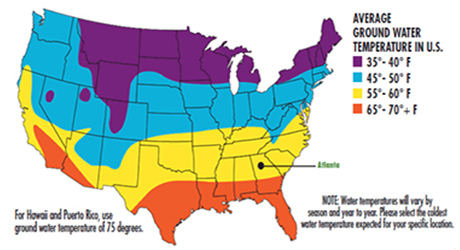 For example, if you live in Atlanta, you have a ground water temperature of 67 degrees Fahrenheit. To reach an ideal hot water temperature of 120 degrees Fahrenheit, subtract 67 from 120. You have a required temperature rise of 53 degrees Fahrenheit.Use the EPA’s map for average groundwater temperature for guidance. 3. Match your GPM and temperature rise to your new water heater unit. TIP: Ask a Home Depot Associate questions about choosing the right size water heater or contact our Installation Services team for help. Look for the Energy Factor (EF) rating on the package. The EF rating measures how efficiently a water heater converts energy into heat as well as how much heat is lost during storage, if applicable. The higher the energy factor, the more efficient the water heater. Be sure the location you choose for installation meets the unit's special ventilation requirements. Install on a wall near a gas supply line, water supply line and electrical power source. This is also the easiest and most cost-effective way to run the venting. Hybrids offer a narrow, 21-inch diameter for access into smaller locations. Allow a 7" clearance around. Install in a dry indoor area with access to or with at least 10 feet of circulating air.